SPECIAL VALUE From Wüsthof, renowned cutlery makers for nearly 200 years, comes the Wüsthof Gourmet line. Each knife is laser cut from a single piece of high–carbon stainless steel for a precise, razor–sharp edge. Plus, each blade is laser tested to ensure desired sharpness and correct cutting angle. Triple–riveted, full–tang handles are contoured to fit comfortably in the hand. Preserve the delicious flavor of your fresh–off–the–grill steaks. With Wüsthof’s razor–sharp edge, there’s no need for serrations. The knife simply glides through your steak, leaving moisture where it belongs and enhancing your dining experience. Perfect for entertaining or everyday use. Set of six steak knives comes with hardwood block for safe, convenient storage. Dishwasher safe, but hand washing is recommended. Limited lifetime warranty. Made in Solingen, Germany. Wüsthof’s state–of–the–art manufacturing methods deliver consistently high and uniform quality. Each knife in the Gourmet line is laser cut from a single piece of high–carbon stainless steel for a precise, razor–sharp edge. Plus, each blade is laser tested to ensure correct cutting angle. Triple–riveted, full–tang handle is made of a durable polymer that’s contoured for a comfortable grip. Quality control experts examine each piece of cutlery for even the slightest defect and all blades are tested to ensure optimal sharpness. Only flawless knives receive the Wüsthof trident logo–a symbol of form, function, and uncompromising quality. Preserve the delicious flavor of your fresh–off–the–grill steaks. With Wüsthof’s razor–sharp edge, there’s no need for serrations. The knife simply glides through your steak, leaving moisture where it belongs and enhancing your dining experience. Perfect for entertaining or everyday use. Set of six steak knives comes with hardwood block for safe, convenient storage. These knives are of extremely poor quality. I purchased them to add to my collection of Wüsthof Classic knives. The edges have chunks of metal missing and the knives rust (I’ve only hand washed them). This happened as someone else stated in under a year’s time. I’ve had my other Wusthof knives (Classic) for just about 15 years and they look as good as the day I bought them. Stick with the Classic collection. The Gourmet Collecfion is junk. I called Wusthof and they told me to mail them in so they could assess them at my expense! They would not send me a shipping label. Since then, I have not mailed them back and I have not purchased anything further from Wusthof. I’m NOT a happy customer after spending thousands of dollars over the years on their brand. Notice the pieces of metal missing from the edges. This happened within months of purchase. Any Wusthof product is a good investment for your kitchen! I did my reasearch and choose these knives. From the early on they would not stay sharp, now pieces of the edge are missing. Maybe from all the sharpening they constantly needed. Rust spots...overall quite displeased. 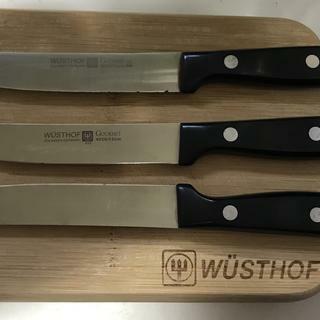 I ordered several W�sthof knives including this steak set. In all my years of cooking these have got to be the best quality knives I've used. Because I needed steak knives. It was the same price as what my parents wanted but came with a block! Makes a good Christmas gift! The price was important with me, Wusthof is a good knife brand. I picked these knives because the Wusthof block holder has a place for 6 knives. Saw and used Wusthof steak knives at my brother's house and we were impressed with the quality. My father in particular raved about the knives and we decided to purchase this set as a Christmas gift. We are sure he will be very pleased! One of the best items on the list. Good price and comes with a knife block - which is important if, like me, you're adding this set to an existing Wusthof knife set in a block that has no slots for steak knives. I have a whole block of Wüsthoff knives I use daily. I like to send them to my adult children when I see a good price. The item seemed to be a good value. Price and there was six knives. i liked the number of pieces offered in the set for the price. Quality of product for the price (ie: value). I'm familiar with the brand. I wanted to upgrade my kitchen utensil collection. Love this brand, I own the Chef's knife and wanted the steak knives as well. This set seemed very fitting for newlyweds! Best knives ever!! If you love to cook...you need these. Where do I go if I need to sharpen? BEST ANSWER: Your local Sur La Table store may have sharpening services on site. If not, many hardware stores offer this too. Always wrap your knives in newspaper when transporting. I prefer professional sharpening 1X per year. If you choose to do it yourself (I recommend a basic sharpening steel), make sure you are taught properly. If your angle is off ever so slightly, it will make your worn knives even worse! Wusthof has a sharpening tool that makes it very simple to put a fine edge on your Wusthof knives. They also make a sharpening steel that takes a little skill but also puts a very sharp edge on any knife. Wüsthof® Diamond Sharpening Steel, 9"
Sur la Table sharpens knives... but I’ve been wanting to take the knife class to learn to sharpen my own a chef told me it was her favorite class they offer. I don't like things on my counter, so I threw the block away. I have a nice knife sharpener. Sorry - I don't have any idea, I haven't needed to get the sharpened yet. The set comes with a sharpener if you want to sharpen it yourself. Sorry I can't help you. I bought a sharpener.